Google has been taking its Internet-delivering balloons to new heights. Well, at least to much greater distances. Google, which has been testing balloon-powered Internet access, announced Thursday that one of its balloons circled the Earth in 22 days. Now beginning its second lap around the world, the balloon marked the project's 500,000th kilometer. 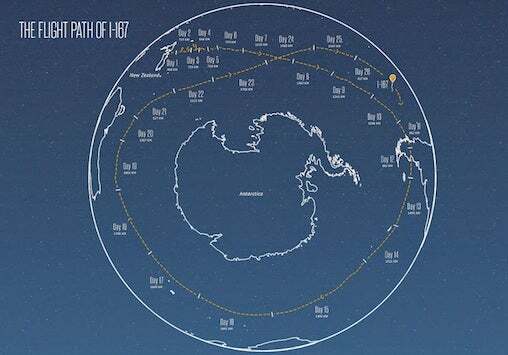 "It enjoyed a few loop-de-loops over the Pacific ocean before heading east on the winds toward Chile and Argentina, and then made its way back around near Australia and New Zealand," wrote Google's Project Loon team on its Google+ page. "Since last June, we've been using the wind data we've collected during flights to refine our prediction models and are now able to forecast balloon trajectories twice as far in advance." Google has been testing high-altitude balloons since last year in an attempt to bring Internet connectivity to the two out of three people around the world who don't have access to a fast and affordable connection. Last June, GoogleX, the company's research arm, launched 30 high-altitude balloons above the Canterbury area of New Zealand as part of a pilot test with 50 users trying to connect to the Internet via the balloons. The goal is to build a ring of balloons, flying around the globe on stratospheric winds about 12.4 miles high, bringing Internet access to remote and underserved areas. The balloons communicate with specially designed antennas on the ground, which in turn connect to ground stations that connect to local Internet service providers. The company isn't alone in its efforts to bring Internet connectivity to underserved areas. News circulated last month that Facebook is reportedly in talks to acquire Titan Aerospace, a New Mexico-based company known for making solar-powered drones. Analysts speculated that Facebook would use the drones similarly to Google's balloons - for Internet connectivity. Titan Aerospace builds lightweight, high-flying drones that can remain aloft for five years. According to Google, the balloon's world trips has provided researchers with more information on how to efficiently fly them, even maneuvering the balloons away from the powerful wind currents of the polar vortex. "We can spend hours and hours running computer simulations, but nothing teaches us as much as actually sending the balloons up into the stratosphere during all four seasons of the year," the company wrote. Google X is also the company division that came up with Glass digitized eyewear and self-driving cars. This article, Google's Internet-delivering balloon circles the Earth, was originally published at Computerworld.com.